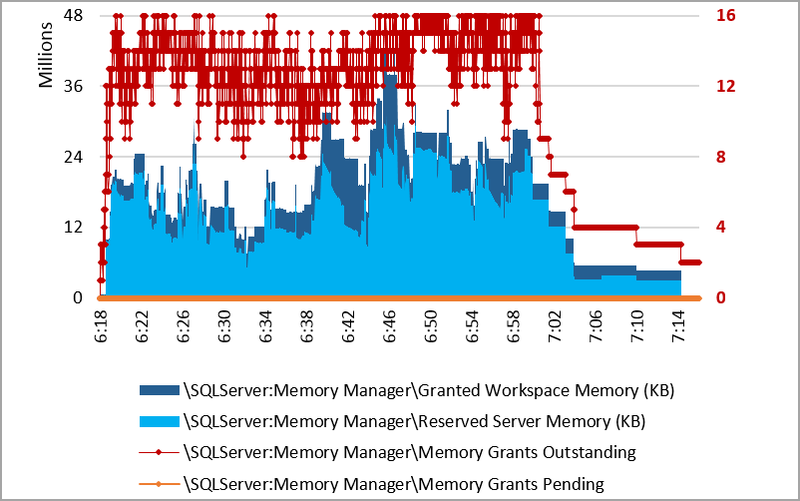 Let's look at the total of SQL Server shared memory for SQL Server 2012 and beyond. As I've mentioned before, the shared memory can be fully accounted for with database cache, stolen, and free categories. By zooming in on the 108 GB to 124 GB range we can see that the sum of the three categories is equal to "Total Server Memory". Lets look at stolen memory a bit. The relationship between memory grants and stolen memory is probably the least intuitive relationship. Remember - if a query gets a memory grant the grant happens at the beginning of query execution. Its just a promise of sort/hash memory to be made available when the query needs it. The grant memory isn't stolen immediately - rather its stolen in small allocations over time as needed by the query. In the graph immediately below, the outstanding grants are shown over time. There are no pending grants during the observation period. Granted memory and reserved memory are both shown as areas, with reserved memory in front of granted memory. Granted memory is consistently greater than reserved memory (in this case, no resource pools have been added beyond the pre-existing default and internal pools). This is how we can determine that the reserved memory is granted memory which hasn't been stolen yet. 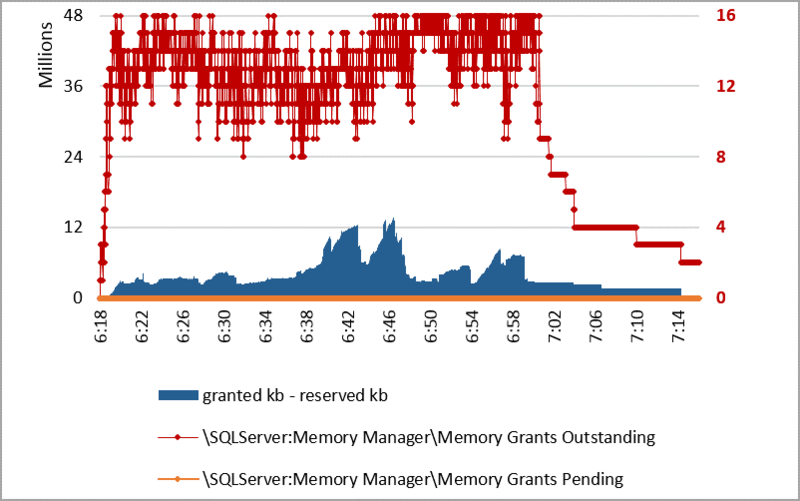 Here is the difference between granted memory and reserved memory, graphed as single measure area graph below, with the number of outstanding grants in a line graph. Now lets stack several memory components in an area graph in front of stolen memory. Let's put in several perfmon metrics directly as well as the difference between granted and reserved memory. Notice that plan cache pages increase slowly throughout the capture period. 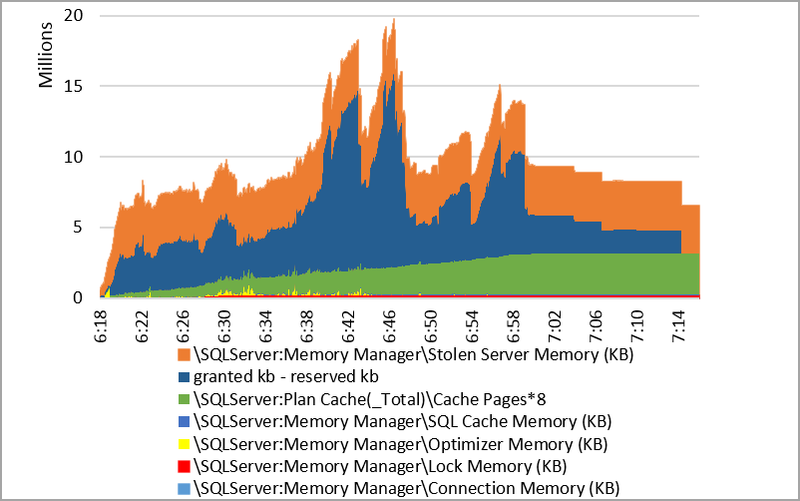 The amount of query memory used (granted kb - reserved kb) is more variable, and together with the other memory metrics selected trends very well with total stolen memory. There's definitely at least 1 significant stolen memory consumer since up to 5 GB of stolen memory is currently unaccounted for. -although plan cache bloat is a fairly common topic, some workloads exeperience much more pressure from workspace memory than from the plan cache. 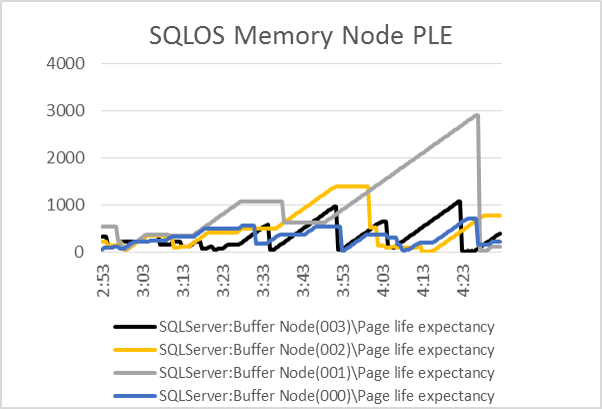 By default, on a (v)NUMA server/vm, SQL Server will partition its shared memory resources by using a count of SQLOS memory nodes equal to the visible (v)NUMA nodes. In that strategy, each SQLOS memory node gets its own IO completion port, its own lazy writer and in SQL Server 2016 there will be one transaction log writer per node (up to 4, on (v/l)cpus 1-4 as needed). 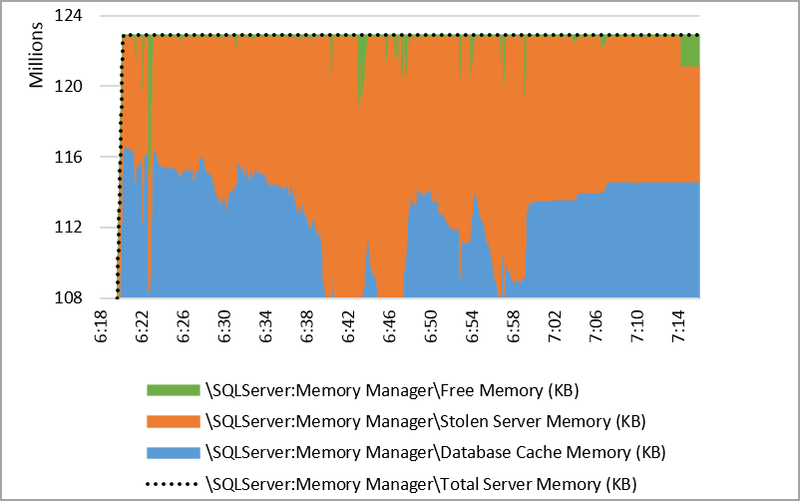 Each SQLOS node gets a portion of the database cache, stolen memory, and free memory. When pages read from disk are inserted into the bpool for a worker, they are inserted into the database cache for the SQLOS memory node associated with the compute node for the scheduler running the worker. 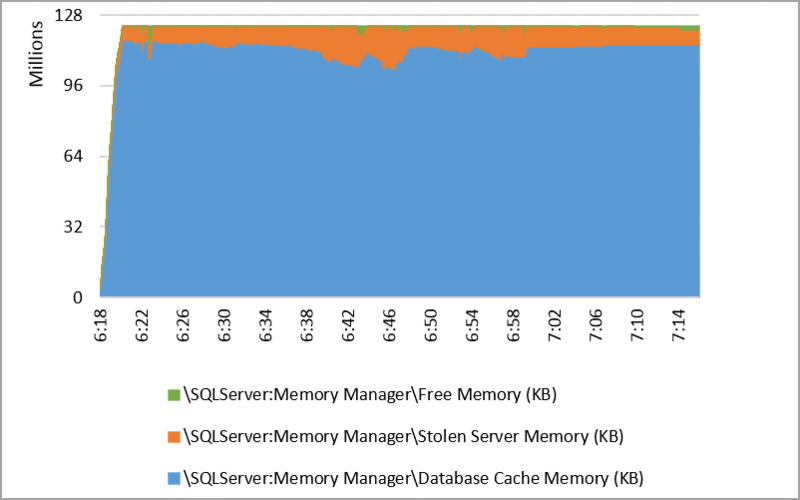 Put all that together: each SQLOS memory node may be experiencing different rate and footprint of pages read, first-writes to new database pages, steal against memory grant (or other steals) and freeing memory. I don't know the formula used for PLE... but each of those factors are part of the calculation. 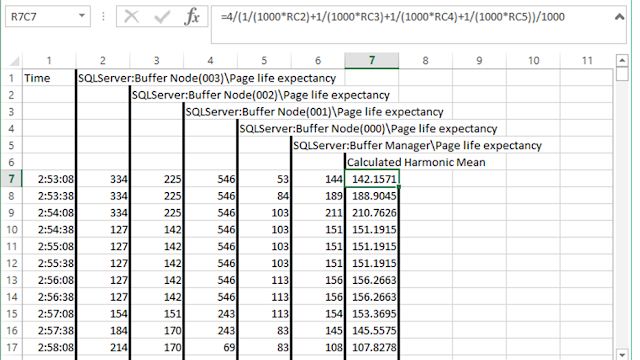 So... each SQLOS node has its own PLE, and these PLE values can vary greatly. Yet the node level PLE is a metric seldom checked. Rather, the overall calculated PLE for the instance is the metric usually consulted. Here's that metric added into the same graph. I've been puzzling for quite a while how the overall PLE was calculated. Its fairly obvious its not an arithmetic mean of the PLEs - it varies gradually even as individual PLEs vary greatly. I figured perhaps it was a weighted average, maybe with weight determined by the amount of database cache on the individual nodes. But that could also be quite volatile, since especially in the case of large hashes, memory can be stolen against a grant very quickly - rapidly shrinking the amount of database cache on an individual SQLOS node. Eventually this Paul Randal blog post was pointed out to me. The post is originally from 2011, but after Matt Slocum pointed out that arithmetic mean didn't fit for deriving the overall PLE it was updated in 2015. "The calculation is: add the reciprocals of (1000 x PLE) for each node, divide that into the number of nodes and then divide by 1000." 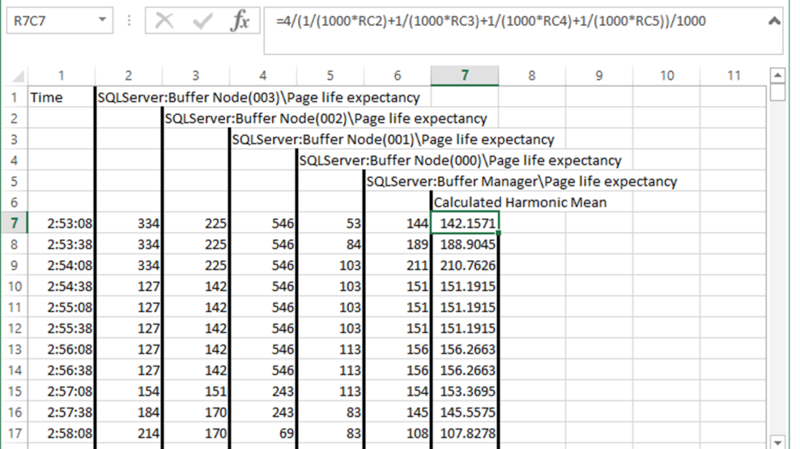 OK... let's plug that formula into Excel along with the data for the 4 SQLOS nodes and the overall PLE to see if it fits. That's a pretty good fit. The very first harmonic mean I calculate rounds to 142 rather than the value of 144 that is the overall PLE. That's not surprising - after seeing how good the fit is otherwise, I suspect that was a timing issue - volatility in the 000 and 001 PLEs probably lead to a slightly different value between the time that the individual SQLOS node values were reported and the value a short time later when the overall PLE was reported. I'm glad that Paul Randal and Matt Slocum dug into this... one fewer question in my heap. I expect it to make a big difference. Even so, I'm still pleasantly surprised how much of a difference it makes. 19 logicaldisk/physicaldisks other than the C Windows install drive. 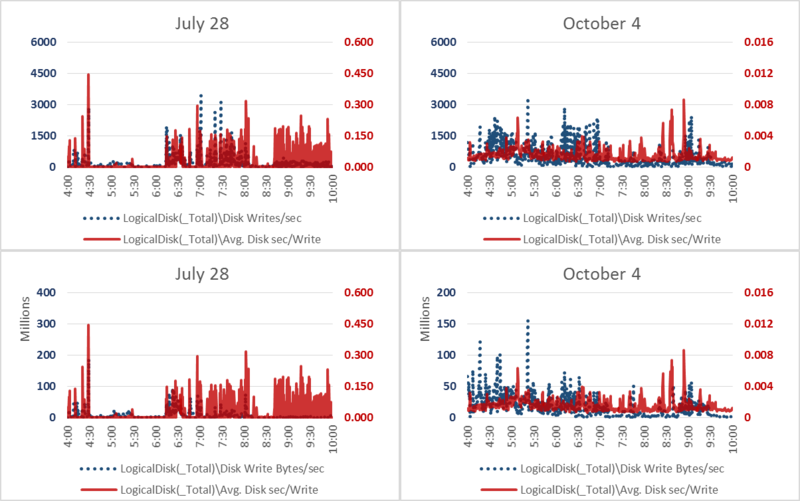 Each guest physicaldisk is its own datastore, each datastore is on a single ESXi host LUN. 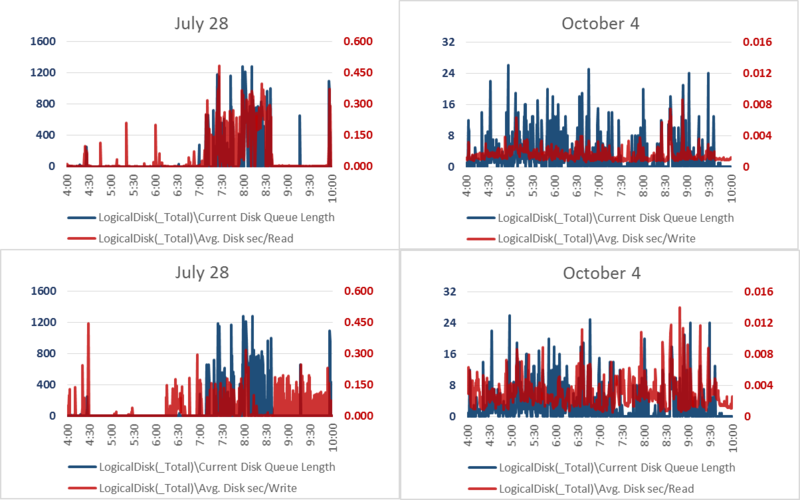 On July 27th, the 19 SQL Server vdisks were distributed among 3 LSI vHBA (with 1 additional LSI vHBA reserved for the C install drive). I finally caught back up with this system. An LSI vHBA for the C install drive has been retained. But the remaining 3 LSI vHBA have been switched out by pvscsi vHBA. The nature of the workload is the same on both days, even though the amount of work done is different. 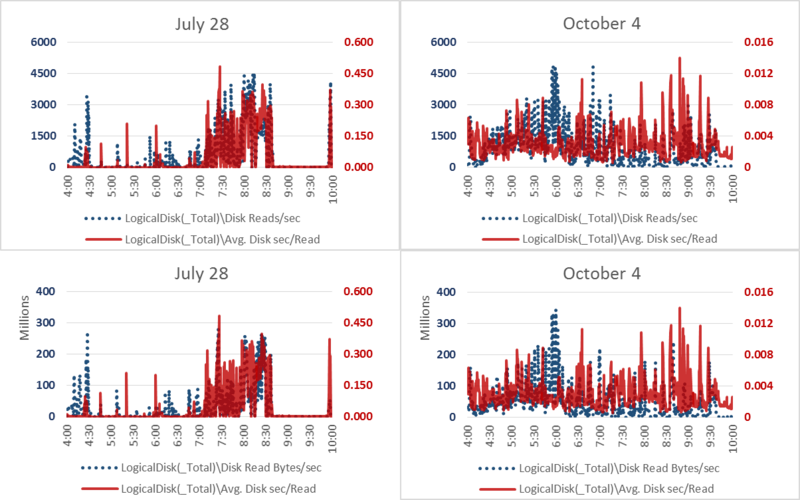 Its a concurrent ETL of many tables, with threads managed in a pool and the pool size is constant between the two days. Lets first look at read behavior before and after the change. I start to cringe when read latency for this workload is over 150 ms. 100 ms I *might* be able to tolerate. After changing to the pvscsi vHBA it looks very healthy at under 16 ms.
OK, what about write behavior? Ouch!! The workload can tolerate up to 10ms average write latency for a bit. 5 ms is the performance target. 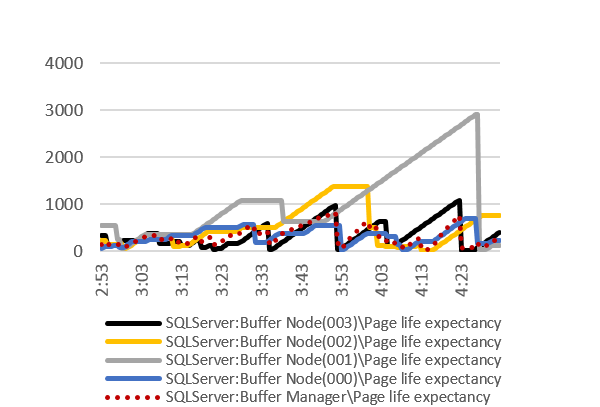 With several measures above 100 ms write latency on July 28th, the system is at risk of transaction log buffer waits, SQL Server free list stalls, and more painful than usual waits on tempdb. 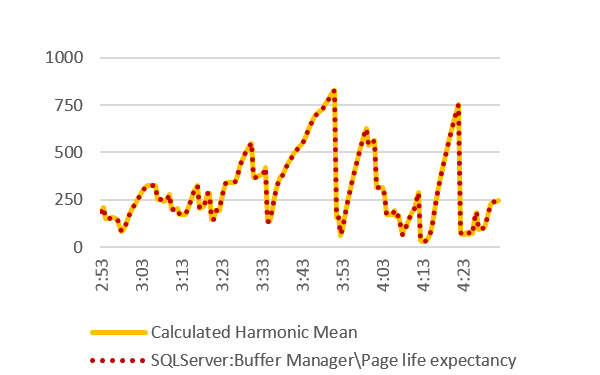 But after the change to pvscsi, all averages are below 10 ms with the majority of time below 5 ms. Whew! Looking at queuing behavior is the most intriguing :-) Maximum device and adapter queue depth is one of the most significant differences between the pvscsi and LSI vHBA adapters. The pvscsi adapter allows increasing the maximum adapter queue depth from default 256 all the way to 1024 (by setting a Windows registry parameter for "ringpages"). Also allows increasing device queue depth from default 64 to 256 (although storport will pass no more than 254 at a time to the lower layer). By contrast, LSI adapter and device queue depths are both lower and no increase is possible.